“We are committed to working towards playing on fewer venues which host multiple codes. Expansion teams Western United and Macarthur will both have minimal use from other codes in their stadiums in the long term, which is what we all need to work towards,” Mr O’Rourke said. The new team, based in Campbelltown, will join the A-League in the 2020/21 season. Who knows. What do you think it will be??? South West Sydney Magpies sounds good to me! Black and white jersey - similar design to Juventus! On the back of a 5-3 loss to the United States women's side, the Matildas have fallen to a 4-1 defeat at the hands of the Colorado Rapids U15's boys side on Tuesday. As reported by The Daily Telegraph, Australia failed to bounce back against the Major League Soccer academy team in another crucial hit out for Ante Milicic's side. 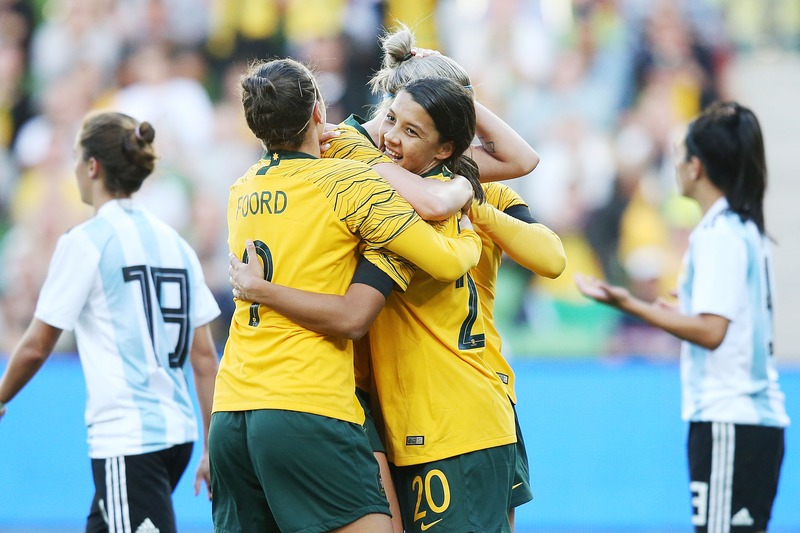 The Matildas did give the US, the current world number one in women's football, a scare last Friday taking the lead temporarily in the second-half before conceding three quick goals. Since then, they've locked in one final official friendly before the Women's World Cup in France with a showdown against the Netherlands. Australia are currently ranked sixth in the world with the Dutch, sitting at eighth, looming as an ideal warm-up prior to the competition. While the Matildas' loss to an U15's side makes for worrying reading, it's a lot better than the 7-0 loss they suffered in 2016 against an U15's Newcastle Jets outfit. Since that time, the side has taken giant strides forward on and off the pitch to loom as genuine World Cup candidates later this year. Macarthur FC/United. Looking forward to seeing the new name. But there are already 2 other Uniteds - "Adelaide United" and the new western Melbourne team "Western United". If the team is just called "Macarthur", it doesn't include our other areas because the Macarthur region only goes as far north as Glenfield, but the Liverpool, Fairfield and Bankstown areas are our areas too, and people from those areas might not support the team if "South West" or "South West Sydney" isn't in the name. The South West Sydney area includes all our areas (Macarthur, Liverpool, Fairfield, Bankstown). Ante Milicic has become the prime coaching candidate for incoming A-League side Macarthur South West United. The Daily Telegraph reports Milicic is the frontrunner with the club keen to make an appointment before next season - giving their first coach a full year to get the team ready before they enter the A-League in 2020. Milicic is currently in charge of the Matildas and will lead them into the World Cup with his long-term future still unclear. Football Federation Australia are reportedly keen to extend his reign in charge but Milicic would stand to earn more if he accepted the role in charge of Macarthur. 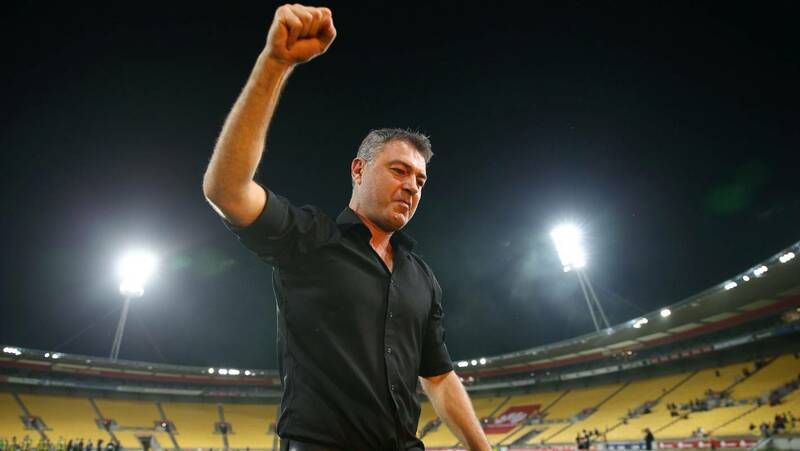 Mark Rudan's tenure at Wellington Phoenix is likely to be short-lived. The coach who revived Wellington Phoenix will sensationally leave the club after just one season but his destination remains unclear. Stuff can confirm Mark Rudan informed the club of his decision to leave three weeks ago, with details of his exit only emerging in the hours leading up to Friday's match against Brisbane Roar. However, the club was not willing to confirm or make a statement on his departure, with that expected to come next week. Rudan has been hotly pursued by expansion club Western United throughout the season on the back of his impressive work with Wellington, who are currently sitting fourth place on the A-League table and remain right in the hunt for a home playoff with just three games left. Although he has declined to comment specifically on the potential of leaving Wellington for an A-League rival, Rudan has openly stated that he cannot continue living apart from his family, who are currently based in Sydney, and that will be the major factor when his imminent resignation is announced by the club. "In hindsight if I knew it was going to be this hard, I wouldn't have taken it," Rudan told Stuff in January, and it appears his desire to be with his family has only grown stronger as the season has wore on. Rudan has also publicly called on the club's ownership group to raise the standards at the Phoenix, demanding more investment in order to build on the success of the 2018-19 season, with offering a marquee deal in attempt to retain joint-Golden Boot leader Roy Krishna and the creation of a centre of excellence high on his wish-list. Mark Rudan has been able to get the best out of unheralded Kiwis such as Alex Rufer. "Do I want to vie for things every year? Yes. I'm pretty clear, I'm driven and I'm ambitious and they know what they are getting from me as well. I've made it pretty clear. Are discussions ongoing? Yes they are," he said in February. But it appears those demands have fallen on deaf ears, with his growing frustration at the lack of ambition shown by the club's owners another key factor into his decision to walk prematurely. While he has refused to comment publicly on his future in recent weeks, initially pointing back to stories on his family situation and his demands for more investment before declining to comment altogether, Stuff understands he has given the club his blessing to begin its search for a replacement, with Melbourne City's Warren Joyce emerging as a surprise target. A source said Rudan made his decision three weeks ago and has even provided his own recommendations for his potential successor. Despite signing on for two years, the source revealed there was an eight-week notice out clause put in his contract by the Phoenix and Rudan even questioned it before he put pen to paper. But that clause is what will allow him to return to Australia where he will likely come up against the Phoenix in his next job, given he will be the hottest coaching prospect on the market — although where or if he will be coaching next season remains unclear. Western United, an ambitious club willing to utilise its two marquee spots, has long been the favourite to secure Rudan's services, and they have already snared standout Phoenix goalkeeper Filip Kurto, but it is understood that a second A-League club, Adelaide United, have also made a play for the passionate Australian given his wonders with Wellington. Adelaide has already confirmed that coach Marco Kurz will be leaving the club at the end of the season, paving way for a potential reunion with Rudan who finished out his playing career in South Australia. There is also the possibility that Rudan could take a year off — an option he has revealed publicly — with Macarthur South-West Sydney's entry into the A-League in 2020-21 looming as a tantalising prospect given his family's close proximity to the club. Regardless of where he goes, it is a major blow for the Phoenix to lose Rudan given the incredible impact he has had on the club, turning them into a genuine title contender within with such a short space of time due to his infectious self confidence and belief. Not only has he been able to get the best out of an unheralded playing squad, with free-scoring forwards Krishna and David Williams leading the way, but he also has restored a Kiwi core to a team that had lost its New Zealand identity in recent years, and their part in the resurgence cannot be underestimated. Young New Zealand prospects Callan Elliot, Gianni Stensness and Ben Waine have all made their A-League debuts during Rudan's tenure, while Sarpreet Singh, Alex Rufer, Liberato Cacace and Louis Fenton have been regulars in the starting XI. Rudan has stated that both the club and country has won him over emotionally during his tenure and had his family situation been different, perhaps he would have been stayed on in Wellington to finish the project he started. But some things are more important than football, and for Rudan his family situation was a deal-breaker. The only issue now is that Rudan's success with the Phoenix could potentially lead to a mass player exodus, with only six players locked into contracts for next season. Although the Phoenix have a major rebuild on their hands again, it will be an almighty job if star players such as captain Andrew Durante, Krishna and Williams are not around to help out. It is imperative the club pulls out all stops to keep them for next season to help lessen the blow of Rudan's departure. 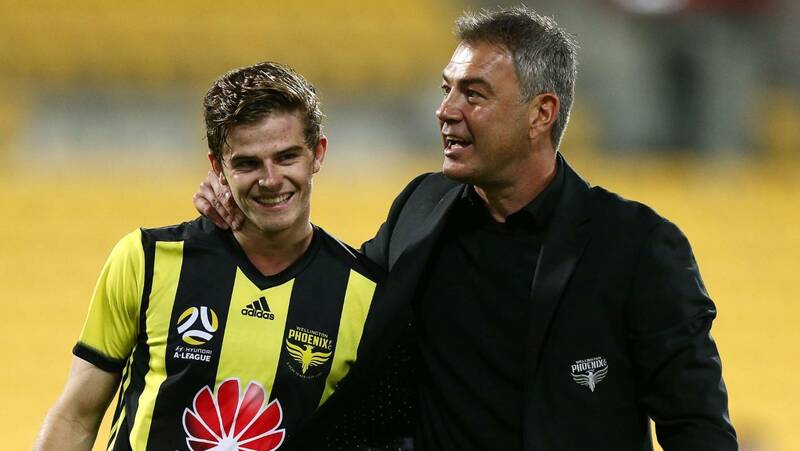 Mark Rudan has already given Wellington Phoenix his blessing to search for a replacement. Football in Australia is notoriously bad at recognising and respecting its history. But head office is hoping to rectify that in a small way by endorsing a new push to recover a long-lost artefact. Back in the day: Soccer's version of The Ashes are weighed in Sydney in 1948. The 'Soccer Ashes' were contested by Australia and New Zealand between 1923 and 1954, but have been lost ever since. The ‘Soccer Ashes’ were contested by the Australian and New Zealand national teams between 1923 and 1954. The trophy for trans-Tasman supremacy in that era was a small razor box mounted in a casket made from wood from both countries - New Zealand honeysuckle and Australian maple - and decorated with a kangaroo and a silver fern Inside the razor box - which had been donated by Queensland Football Association secretary William Fisher, a soldier who carried it with him at the Gallipoli landing - were the ashes of cigars smoked by the Australian captain, Alec Gibb, and his New Zealand counterpart, George Campbell, after the first 'Test' series. Australia won the Soccer Ashes in 1954 but all trace of the trophy or even mention of it vanished after that. Historian Ian Syson, Football Nation Radio's David Krunic and FFA chairman Chris Nikou are determined to find them as soon as possible - if not before this Anzac Day, then the next one. "We are probably better than any other code at losing trophies and it's because we disrespect our past - every new phase in Australian soccer tries to wipe out everything that's gone before," Syson told the Hairdryer. Nikou, who has already made clear his desire for an Australian football museum, has lended the heft of the FFA's senior management team to the search. History helper: FFA chairman Chris Nikou wants to help find the Soccer Ashes. "It's on our radar. If we can find it, that would be a great outcome. Ian's very passionate about it so we're trying to support them to do that," Nikou said. It's not the first time a once-prized piece of football silverware has found an undignified end. The old Australian Cup was famously thrown out in 2011 when the old Hakoah Club was being demolished. Offered to FFA, the federation initially wasn't interested in it. Fortunately they came to their senses and modelled the FFA Cup trophy in its image. There's no reason why the same can't be done with the Soccer Ashes, and regular trans-Tasman international matches restored to their former prominence. "We certainly could recreate it," Nikou said. "I've raised it with New Zealand already." Syson believes there is less than a 50 per cent chance of finding the Soccer Ashes and has had mixed success with Socceroos of that vintage - some can't remember it at all. If you know anything, please get in touch. The A-League grand final is set to battle for attention with the results of the federal election after Football Federation Australia ruled out moving the competition's decider away from its scheduled date. Prime Minister Scott Morrison showed little regard for Australian football fans when he announced on Thursday morning that the election will take place on May 18 - the same day as the A-League grand final. The decider is pencilled in to be a night-time event, meaning results of the election will begin to trickle out while the domestic game's top prize is up for grabs. Thanks ScoMo: The 2019 federal election will clash with the A-League's grand final. Instead of competing for eyeballs with other codes, FFA will also have to contend with Antony Green on ABC for viewers. Sunday morning's match reports will be buried underneath either the news of an expected change in leadership - or a shock return to power for the Coalition. It hasn't deterred FFA, however, with sources informing The Hairdryer the grand final will almost certainly go ahead on May 18. Perth and Sydney are the frontrunners to host the event with Glory and the Sky Blues on course for a top-two finish. Here's another one for your diaries that week. Wednesday, May 15 is the day we'll learn the name, logo and colours of Sydney's newest professional club. The successful Macarthur-South West Sydney expansion bid is planning a huge launch for their visual identity after months of data gathering, surveying and work with focus groups and designers. A black and white colour scheme has long been rumoured but we'll all know for sure in just a tick over a month. The Hairdryer hears there was a surprising level of supporter consensus in favour of the option settled upon. The A-League remains on course to split from FFA's jurisdiction before the start of the new season but it appears the new independent entity will remain at arm's length from the governing body - at least in distance. The talk has long been that an independent A-League would be based in Melbourne to provide the new organisation with a fresh start and clean break from the FFA - but The Hairdryer hears financial considerations have convinced the clubs to keep the headquarters in Sydney. Already facing considerable redundancy payments associated with the split, an interstate relocation would significantly increase the costs of independence likely to be borne upon the clubs. Sources suggest club owners are happy to retain a proportion of the FFA staff primarily employed for A-League operations and are eager to avoid an expensive overhaul simply for the purpose of moving to another city. Sydney FC Captain and former Socceroo Alex Brosque to retire at the end of the season. Melbourne Victory Captain and former Socceroo Carl Valeri also set to retire at the end of the season. There's an article saying the new Macarthur A League club might go with the name "Dharawal" which is a name of an Aboriginal nation that was in and around Sydney. I hope they don't choose that. That would turn me and a lot of others away who don't like Aboriginal stuff shoved down our throats all the time. They should keep race out of it. I don't see it as being "inclusive" at all. I see it as putting one race ahead of the others. There is a chance they will use the name "Macarthur Football Club" or "Macarthur Bulls Football Club". Those options are fine with me. It looks like the colours will be black and white. That is a bit of sad news, he’s been good over his career. Did you read the article?? ?